Book of the Week at Boffin Books! This week we asked one of our festival bookshops, Boffin Books, about their book of the week. 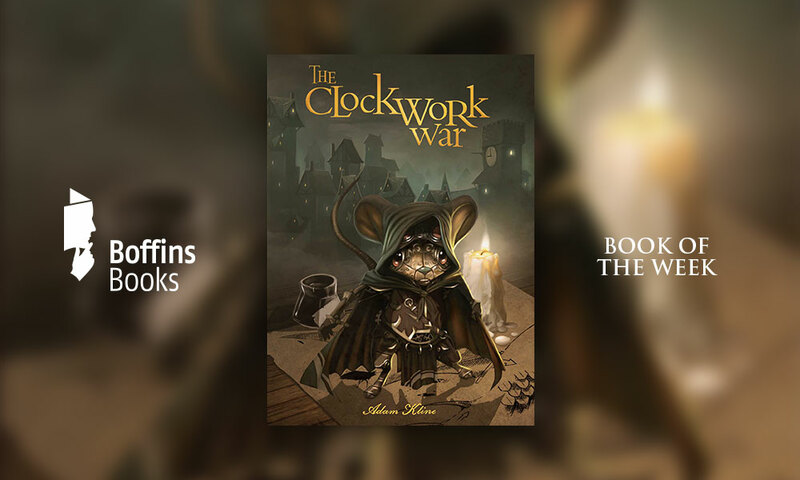 The Clockwork War is a story of imagination, evil corporations and steampunk adventure. A young boy named Karlheinz Indergarten and his friend Leopold Croak love playing in a gigantic oak tree and have many sweeping adventures aboard pirate ships and castles in the sky. One day Leopold is struck by lightning and loses his imagination. As the boys grow, their paths take them in very different directions. Karl finds a love for clock-making as an apprentice to a mystical man and Leopold becomes a thirsty business man, intent on money and progress and threatening everything Karl holds dear. Karl assembles a clockwork army to fight back and the war to save his world begins. This new release by Adam Kline, who has written for box office film companies like Warner Bros and Disney, reads like you’re in an adventure film with epic battles, friendship torn apart and a quest to bring imagination back to the world, taking kids on a technological and truly magical journey. Suitable for ages 8 and up, I found this very engaging, exciting and reminiscent of many of my favourite books such as Emily Rodda’s Deltora Quest, Lemony Snicket’s Series of Unfortunate Events and Jessica Townsend’s Nevermoor. I think it’s a hidden gem in primary fiction. Thanks so much, Amy; it sounds like something our young Scribblers will love!